Urdu, the official language of the Mughal Court, was a language of love and poetry. Its elegance lent itself naturally to delicate expressions of emotion. In the Golden Age of the Mughals, Ghazals and Shayiris populated the courts. Love and Beauty of all forms was celebrated. Spurned love, unrequited love, unconditional love, sparks of longing and infatuation were made immortal by the poets of the time. Described by soulful sentences were the eyes, cheeks, complexion, fragrance and hair of the lover. Teri Zulfen Jis Ke Baazoo Par Parishaan Ho Gaeen"
Said Mirza Ghalib, one of the most eminent poets of the Mughal Empire. 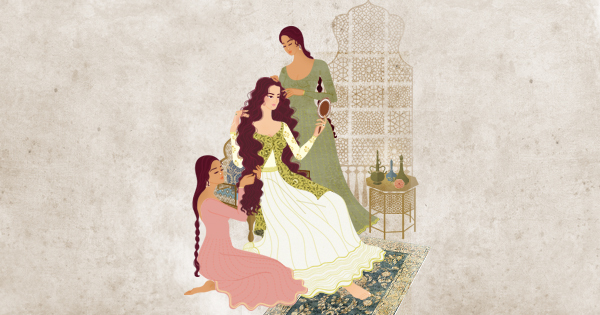 For tresses that stole their Prince’s sleep, the Royal ladies of the Mughal Era, resorted to some secret potions. (which were as elaborate as the praise their hair received). Uncovered and simplified for you, here are these secrets from the Royal Zenanas. How do you kill two birds with one stone? By using Amlaki, of course. The juice extract from gooseberry was known to strengthen hair and give it a mirror-like shine. It was boiled in coconut oil and massaged onto their scalps by their maidens in waiting, a night before the hair was washed. Hair that looks shiny and feels strong also needed to smell nice. Shaikh Abu al-Fazal ibn Mubarak, the vizier of the Mughal emperor Akbar, wrote in his book Ain-i-Akbari that the Mughal queens had hair that wafted with floral fragrances. On special days, oils from flowers like jasmine and lavender were distilled and mixed with the amalki, coconut oil hair mask. The act of oiling was performed with attention to the last detail. Taking care to soak the oil in properly, a handful of it was placed on the crown of the heads. An invigorating massage followed, at the end of which hair was neatly tied into braids. They were careful not to rub the ends together, for it was believed to cause split ends. The ends of the braids were gathered on top of the head (to soak in excess oil), and then tied with a thin scarf. Gentle cleansers like shikakai and ritha were boiled in water the night before the princesses’ hair wash. At times, when they needed an extra cleanse, amalaki would also be boiled in water. This liquid would then be strained and used as the last rinse. Loban, an incense blend, was burnt in karandhis (special baskets with coal in them). Once their hair was washed, the princesses lay down on muslin cloths and dried their hair by spreading it over the karandhis. It dried the hair faster, removing extra water from the hair and face, and the fragrance from the loban lasted for days. After the hair was dried, the Mughals used wooden combs to style it. These combs protected the scalp and took care of many other post-wash concerns. A trip to a museum may reveal some more ornate versions like ivory, silver, and gold on display. Portraits of Mughal princesses seldom show their hair loose or on display. They wore braids or chingons and were usually covered by a decorative veil. Delicate garlands of mogra jasmine, chameli or marigold adorned their healthy, shiny tresses. 2) Pour oil on the crown of your scalp and let it soak in before you start massaging your scalp. 3) Don’t rub the ends of your hair too roughly, as it can weaken them and cause split ends. 5) Switch to a wide-toothed wooden comb to brush out the tangles of your wet hair, and distribute your scalp’s natural oils evenly.